(Indianapolis, Ind.) 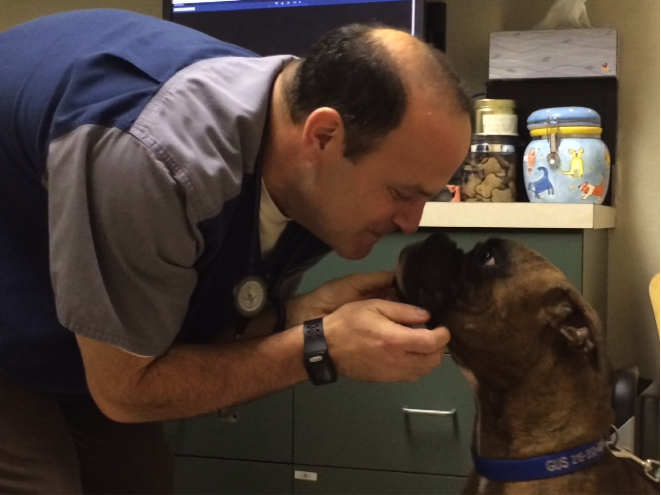 From death’s doorstep to a normal life span, Gus, a boxer, is alive today thanks to incredible professional collaboration and owner commitment stretching from Philadelphia to Cincinnati in June 2014. Owned by Lissa and Gary Brown, of Flourtown, Pa., Gus began showing signs of nausea and subsequent vomiting and was diagnosed with a slight heart murmur at four months of age. After a check-up from Gus’s primary veterinarian, Dr. Andrea Orscher, in Fort Washington, Pa., the dog was referred to Dr. Beth Bossbaly, in Levittown, Pa., an ACVIM Board-certified cardiologist. Chest radiographs revealed an enlarged heart but no signs of congestive heart failure. Because of his history, Bossbaly placed a 24-hour Holter monitor on Gus and gave the Browns a diary in which to record his specific activities and corresponding time of day during the monitoring any events or periods when they saw Gus’ heart pounding at home. The recording monitor revealed rapid heart rates with arrhythmia that landed Gus in the ICU immediately. Next, Gus was referred to the University of Pennsylvania School of Veterinary Medicine, where he was seen by Dr. Mark Oyama, another Board-certified cardiologist. Oyama diagnosed Gus’ condition as a unique form supraventricular tachycardia (SVT), a congenital electrical defect that permits electrical impulses to travel between the top and bottom portions of the heart outside of the normal single pathway. This allows the electrical impulse to continuously circulate around the heart, Oyama explains, and results in the accelerated heart rate with which Gus presented. “We then have to do fine mapping, in which we determine within a millimeter or so where this accessory pathway lies. Radio frequency energy is then delivered through a special catheter whose tip is positioned on the accessory pathway. Without the surgery and with the severity of Gus’ rhythms, Wright speculates he would most likely not have survived more than a year or two. And during that span he would have required several hospitalizations to control the rapid heart rhythm. The veterinary treatment team will be introduced at the 2015 ACVIM Forum in Indianapolis 10 a.m. Thursday, June 4. This special Animal Survivor event will be held in the Indiana Convention Center exhibit hall and the emcee will be Tim Doty, morning/noon news anchor for WTTV Indianapolis. Members of the media are invited to attend. Media Note: Accredited members of the media may attend the 2015 ACVIM Forum at no charge. However, you are required to register with the ACVIM. For media registration, please fill out a registration form or contact Laurie Nelson at Laurie@ACVIM.org or 303.231.9933 Ext. 101.